Chi Zijian, short stories for three Lu Xun awards. For a better understanding of the writer Chi Zijian, I read her short story collections which, outside of China, are hardly mentioned. Yet some of them are of very high standard. She was born in 1964 in the far north of China, near the small town of Mohe, along the Amur River which marks the border with Russia. She leaves her hometown to a Normal school and then to Beijing Normal University and the Lu Xun College of Literature. She began writing in 1984 and led a significant historical research on Manchukuo, “The puppet regime in Mandchuria”. 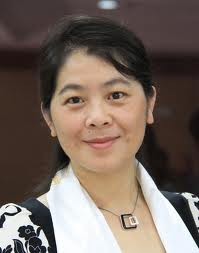 She is now vice-president of the Writers Union of Heilongjiang which she joined in 1990. She is a very prolific writer who has published more than 40 novels and novellas in very different styles and a wide range of topics. She was awarded three times the Lu Xun Literary Prize for her short stories and, in 2008, the Mao Dun prize for her novel “The last quarter of the moon” which was mentioned a few weeks ago. The central theme of her work is in fact the struggle between good and evil, illustrated in her favorite book “Sunny above the clouds,” written as to mourn the death of her husband, a provincial official, killed in a car accident. Her latest book “White snow and black raven” (2010) deals with an epidemic in 1910 which killed one out of five of the residents in Harbin, though at the time, this city of 100,000 inhabitants involving Russians and Chinese, showed great economic activity. Five collections of short stories are available, three in French (1 to 3), two in English (4 and 5), but the best collection (“Figments of the Supernatural”) is not the easiest to find! Supernatural and nature are present in all her work. The link with nature, unity with the animal world are also highlighted. Sometimes there is a pantheistic approach along the lines of Shen Congwen. She mentions that the omnipresence of the supernatural is coming from the ghost stories told by her grandmother. She highlights the presence of the spiritual and magic in everyday life. But this is not a spiritual quest as in “Soul Mountain” by Gao Xingjian, although aboriginal myth and tradition have an important place in her work. In “Journey to the land of white nights” one of her best short stories, the narrator is mourning a husband who abandoned her and died. A trip in the north they promised to each other in order to admire the white nights, but is he really with her? The dead are among us. Sometimes she is close to traditional themes: the dead who will not join his tomb, who wants to be led there by his widow (“Cemetary under the snow”). The historical approach does not seem to really interest her. Almost by chance, we notice that some short stories take place during the Japanese occupation which has little impact on the lives of villagers except in “The incense factory”. Sometimes she goes along classical themes: the decadence of a large family like in “The jade bracelet”, but where the historical events or the environment play a limited role. What is surprising is the importance of love between the characters; farmers as in “Potato lovers”. We are far from the brutality of peasant sexuality as with Mo Yan! Similarly, the analysis of a disturbed love as in “A flock in the wilderness,” is very finely done. Women play a major role and equality with men in the modern period is no longer a problem. Similarly, social criticism is marginal and always indirect. In the style of Lu Xun, the sale of children and the disasters they create in families and between siblings are underlined in “A flock in the wilderness” or “The jade bracelet.” Very hard traditions which hurt some wives and the maids are mentioned, but not really denounced. On the other hand in several short stories, the tone is a little idyllic as in Shen Congwen; it’s hard to believe that humanity is as good as that (“For six silver dishes”). We can be sometimes a bit disappointed with the style and composition of some short stories. However, with talent, she avoids sentimentality and evokes events, sometimes harsh, with detachment. In addition, the author usually knows how to keep us interested, twists are many. The conclusion of many short stories is sometimes unexpected (“The jade bracelet”) or dramatic (“The Yangge dancer”). We are not convinced by short stories in the style of crime novels as “Nine thoughts”, a murder investigation. Well organised but with a little padding and with a murderer who confesses very easily, terrorized by the fear of having caught AIDS! (1) “The Yangge dancer”, translated by Dong Chun, Bleu de Chine, 1997. (2) “The jade bracelet”, translated by Dong Chun, Bleu de Chine, 2002. (3) “The incense factory”, translated by Dong Chun, Bleu de Chine, 2004. (4) “A flock in the wilderness.” Panda Books, Beijing 2005. (5) “Figments of the Supernatural”, translated by Simon Patton. James Joyce Press. Sydney 2004.